Each year, the USDA provides extensive data related to farmland values, rental rates, and other indicators of economic performance by county, state, type of agriculture and other meaningful categorizations of agricultural activity. These data are among the most heavily utilized series for providing information about the changing asset values, costs of land rental, and the general health of the agricultural sector. Yesterday’s post provided updated Illinois farmland values along with revisions to the indexing series that resulted from revisions following the most recent five-year Census of agriculture. The previous farmdocdaily post reviewed rental rates and relationships through time for Illinois including difference by productivity. This post continues that thread, and demonstrates the usage of two of the farmland-related tools available for download from farmdoc and maintained in the TIAA Center for Farmland Research with updated data from this year’s USDA release. The tools used to generate the graphs below, and related items are available here for download. In addition to total farm real estate including land and buildings, USDA also releases cropland values along with rental rates for farmland by type and usage. One measure of the return to cropland is the rental income available to that land, less property taxes, divided by the value of that land. There are of course many specific additional features that determine the actual return realized, but that definition provides a useful benchmark that can be compared through time and across locations. For most of the period from 1960 to the present, there are data available for both cropland and total farm real estate values for up to 42 of the states, along with estimates of the rental income and reasonable proxies for the property tax load (it is noted that taxes can and do vary widely within a state or region). The Farmland Values and Returns by State spreadsheet provides four related graphical tabulations, and associated valuation for each of the available states, and allows the user to tabulate either cropland returns or total farm real estate measures. The user simply selects the State and the type of data tabulation (Cropland or Farm Real Estate) and is provided the following set of graphs along with the underlying valuation data from USDA formatted in a convenient tabular form. All states for which data are available also are provided along with their values through time from 1968 through 2017 for convenience. It is interesting to compare the patterns be region and to note the strong consistency in valuation and returns by region. 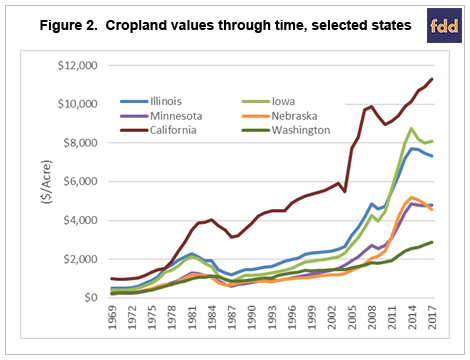 Figure 2 compares selected states including Illinois, Iowa, Minnesota, Nebraska, California and Washington through time. California has a different crop mix and different non-ag pressures than the more agricultural states included and thus has had a more pronounced set of changes. Illinois and Iowa are fairly similar except that recently Iowa had both greater rates of increase and decrease than Illinois. Minnesota and Nebraska are included together as analogs to Iowa and Illinois. If the scale were in $/bushel of corn instead, they would have looked very much like Illinois and Iowa. What seems notable in the survey results that Washington has continued a more constant upward trend is likewise at least partly attributable to the different crop mixes. The second utility also maintained at the TIAA Center for Farmland Research is provided on the second tab of the spreadsheet named Farmland Value Indexing utility. This spreadsheet automates the process demonstrated in the indexes at http://farmdoc.illinois.edu/manage/pdfs/index_numbers.pdf and allows a user to find a relative value of farmland at one date based on known information at a different date for any of the states for which USDA provides data. In addition, it allows the calculation of rates of capital gain and of income return and total return over user-selected intervals. This utility can be useful, for example, in establishing an estimate of tax basis, or in comparing values of different quality parcels through time. It works in both forward and backward looking time intervals, so it could also be used to estimate the current value against an original acquisition value indexed to average rates of gain in the same location over the same period of time. 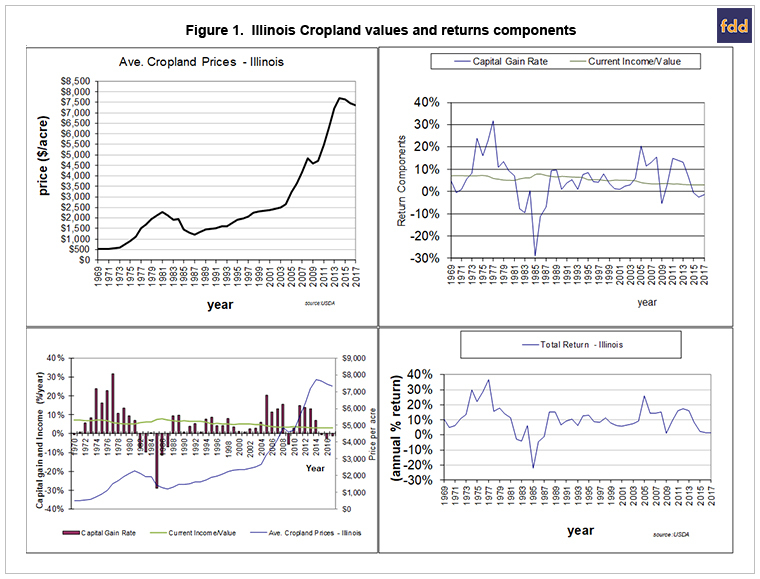 In the examples shown, suppose the user was interested in evaluating an investment in Illinois cropland from 2000-2017. 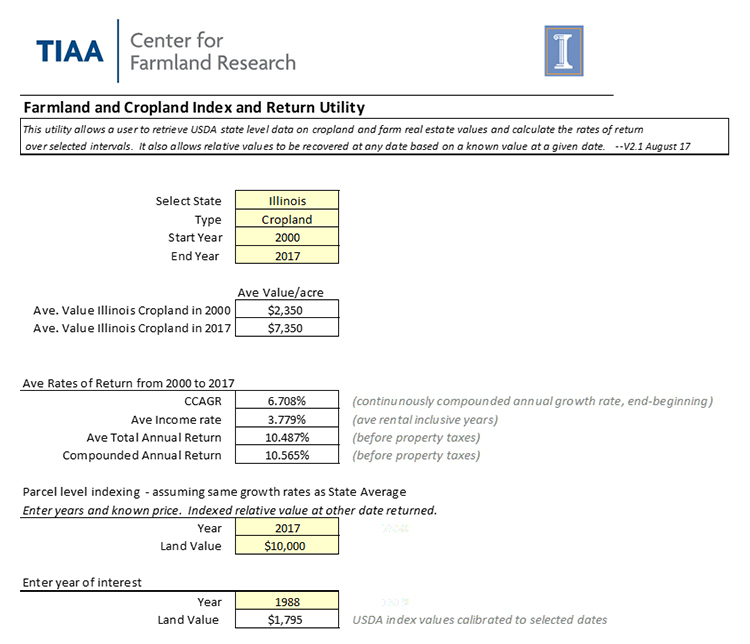 As shown, after the user-selected inputs are chosen, the utility returns average values of Illinois farmland of $2,350 in 2000 and $7,350 in 2017. The utility also provides a convenient means to determine the continuously compounded growth rate or CCAGR average rate of return by comparing any two points in time . In addition, the average cash return within each of those years determined by dividing the cash rent by asset value is shown at 3.779%. This return is a raw cash return and does not reflect estimates of the property tax load (those return series are available elsewhere in Center maintained databases). In the lower section, a relative value indexing utility is provided to determine indexed values between two dates with one known transaction price. In the example shown, suppose the user inherited land in 1988 and sold it in 2017 for $10,000 per acre. Using the same rate of appreciation as in the USDA data implies that the value in 1988 of $1,795 would have resulted in a current value of $10,000. If the known original sales price and date were entered in the upper section, then the current estimate of value would appear in the lower land value cell. Bruce J. Sherrick, Ph.D., Marjorie and Jerry Fruin Professor of Farmland Economics and Director, TIAA Center for Farmland Research, University of Illinois. One approach that is commonly used it to calculate the continuously compounded rate of return by taking the natural logarithm of the ratio of prices, divided by the number of periods of growth. In the present example that would result in ln(7,350/2,350)/(2017-2000) = 6.708% continuously compounded capital gain rate.